Looking for a short-term summer job? Want to gain hands-on experience working in a professional setting and in an exciting, fast-paced environment? The Federation for the Humanities and Social Sciences is recruiting close to 120 paid short-term contract workers to support the delivery of Congress 2018. The Congress of the Humanities and Social Sciences, the largest interdisciplinary gathering of researchers in Canada, is coming to the University of Regina from May 26 to June 1, 2018. Congress 2018 will involve seven days of 66 academic associations holding annual conferences, with up to 7,000 expected attendees, 200+ open events, and 4,000+ presentations. The Federation, in partnership with the University of Regina, has created a rich array of daily programming—from Big Thinking lectures to Career Corner workshops and the Community Connections series. Assistants are needed for registration, event support, association liaison, and even for blogging and tweeting. Full position descriptions are available online, and everyone is welcome to apply. You can apply to work for the full seven days, or just the days you have free time. No resume necessary — just complete a short online application by Friday, March 9. Win-win: Get access to Congress and get paid! When not on duty, you’ll benefit by networking with Congress attendees, meeting influential professors, researchers and policymakers, attending open events, and browsing the Congress Expo. You’ll also receive an official Congress 2018 t-shirt to keep as a memento. Don’t delay! Applications are due March 9, 2018. 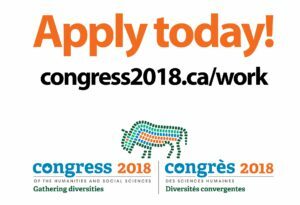 For more information, visit www.congress2018.ca/work.